After the “Virginia Coup,” where Republican legislators gerrymandered election lines, does anyone doubt that Reince Priebus is serious about rigging the Electoral College? On a day when most Americans were focused on the stirring second inaugural address of President Barack Obama—and on the broader majesty of the transference of an election result into a governing mandate—Republican state senators in Virginia hatched an elaborate scheme to rig the electoral system against democracy. Prevented by an even 20-20 divide in the chamber from gerrymandering Senate districts to favor one party or the other, the Republicans knew that their only opening to draw lines that favored their candidates in this fall’s off-year elections would be if at least one Democrat were missing. Inauguration Day gave them an opening, as an African-American senator, a veteran of the civil rights movement, was in Washington to recognize the beginning of the new term of the nation’s first African-American president. In a matter of minutes, the Republicans introduced and approved—on a 20-19 vote—a new map that is designed to concentrate African-American and liberal white votes in a handful of districts while virtually guaranteeing that Republicans will win a majority of the new districts and control of the legislature. And if a Republican wins the governorship this fall, the GOP will, thanks to a legislative coup and the electoral map it created, have complete control of a state that was easily won by Barack Obama in 2008 and 2012, that has two Democratic senators and that most observers believe is trending Democratic. Shaken by the overwhelming defeats of 2012—a 5 million popular-vote defeat in the presidential race, an Electoral College wipeout, the loss of two US Senate seats in a year where they had been expected to gain, a 1.4 million popular vote deficit in US House races nationwide and the loss of seven of eleven gubernatorial races that were in play—Republican National Committee chairman Reince Priebus has made it clear that he wants his partisan minions to use what power they retain to rig the electoral process. The Virginia example is blatant. But it is not isolated. It is part of a national strategy to allow Republicans to “win” even when they lose. And its primary focus will be on gerrymandering not just state legislatures and the US House but on rigging the Electoral College. Last week, Priebus urged Republican governors and legislators to take up what was once a fringe scheme to change the rules for distribution of Electoral College votes. Under the Priebus plan, electoral votes from “battleground” states that now regularly back Democrats for president would be allocated not to the statewide winner but to the winners of individual congressional districts. “I think it’s something that a lot of states that have been consistently blue [Democratic in presidential politics] that are fully controlled red [in the statehouse] ought to be considering,” Priebus says with regard to the schemes for distributing electoral votes by district rather than the traditional awarding of the votes of each state (except those of Nebraska and Maine, which have historically used narrowly defined district plans) to the winner. This is not just a theoretical discussion. Legislation to change how electoral votes are distributed is already being prepared in Michigan, Pennsylvania and Wisconsin. And Republicans in three other states where their party controls the governorship and the legislature—Florida, Ohio and Virginia—are openly discussing the Priebus plan. Those six states voted for President Obama in 2012 by comfortable margins. Yet, had the Priebus plan been in place just in those six states before the 2012 election, the president’s Electoral College margin would have collapsed from a 322-206 landslide to a 270-268 squeaker. A variation on the Priebus plan, which would give each state’s two statewide electoral votes to whoever won the most congressional districts, would have elected Republican Mitt Romney. So President Obama would have won by 5 million votes, carried the majority of states and swept the battlegrounds. But Romney would have been inaugurated as the nation’s forty-fifth president. That’s not democracy. But that is the point of the Priebus plan. Priebus and his team have seen the demographic data. They know that their party’s crude appeals to the past—“in memory of General ‘Stonewall’ Jackson”—have less and less appeal to an American electorate that election results and polling data suggest has little taste for Tea Party fantasies schemes to redistribute wealth upward, American Legislative Exchange Council “Stand Your Ground” laws or attempts to divide the country along lines of race, gender or sexuality. But Priebus and his allies—including key players such as Wisconsin Governor Scott Walker, who calls the scheme “an interesting concept…a plausible concept”—also know that a sly rewriting of the rules for the distribution of Electoral College votes could get them back in the presidential game for 2016. Priebus has a long history of seeking to game the political system—supporting restrictive “voter ID” laws, seeking to end same-day voter registration and aligning Republicans with groups that make little secret of their determination to intimidate likely Democratic voters. He also has made the RNC an aggressive player in developing and supporting strategies to gerrymander congressional and state legislative district lines (while at the same time isolating minority voters) in order to guarantee elections “wins” even when Republicans lose popular support. In 2012, when Republicans did in fact lose popular support, the strategy paid off handsomely. Democrats won the national popular vote for congressional seats by a striking 1.4 million votes. Yet, Republicans retained control of the House and, with it, an ability to block agendas favored by the American people. The Electoral College gambit now being advanced by Priebus builds on gerrymandering strategy, with an ambitious goal. Under the current rules, Barack Obama has twice won the presidency with more than 51 percent of the vote—the first president since Dwight Eisenhower to do so—and secured sweeping Electoral College victories. But Republican statehouse wins in 2010 gave the party the ability to game the electoral process, not just for elected members of the US House but for electing the president. Because of gerrymandering by Republican governors and legislators, and the concentration of Democratic votes in urban areas and college towns, divvying up Electoral College votes based on congressional district pluralities would in almost every battleground state yield significantly better results for the GOP. In Wisconsin, where Obama won in 2012 by a wider margin than he did nationally, the president would only have gotten half the electoral votes. In Pennsylvania, where Obama won easily, he would not have gotten the twenty electoral votes that he did; instead, under the Priebus plan, as many as thirteen votes would have gone to Republican Mitt Romney. FairVote: The Center for Voting and Democracy has run the numbers. They say the results would have been dramatically closer and might even have yielded that Romney win. Under the most commonly proposed district plan (the statewide winner gets two votes with the rest divided by congressional district), Obama would have secured the narrowest possible victory: 270-268. Under more aggressive plans (including the one that awards electoral votes by district and then gives the two statewide votes to the candidate who won the most districts), Romney would have won 280-258. Americans who are more respectful of democracy should also understand the stakes. That’s the right standard for a modern nation that respects democracy, just the right standard for drawing district lines in the states would preclude a surprise gerrymandering session of the legislature on the day of President Obama’s inauguration and celebrations of the Rev. Martin Luther King, Jr.’s, birth. But just as Virginia Republicans were willing to abandon any pretense of fairness in order to game the system for statewide electoral advantage, there is every reason to believe that Republican legislators in states across the country will, with encouragement from the national chairman of their party, move to rig the Electoral College so that a losing Republican might again “win” the presidency—as popular-vote loser George W. Bush did in 2000, with an assist from a Republican-dominated US Supreme Court. Americans who presume that there are limits to the willingness of Priebus and his Republican stalwarts to rig the rules in their favor have not been paying attention. The Virginia coup should serve as their wake-up call. 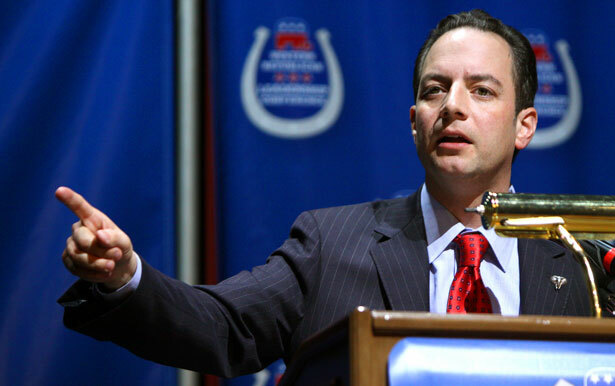 Reince Priebus’ GOP Version2013 threatens not just Democratic victories but democracy itself. For more on GOP shenanigans, read John Nichols’s primer on filibuster reform.